I figure this is something you do once, just to get it out of your system. If you think about coming back, I’ll recommend my step-son, who is a terrific psychoanalyst. Here’s the concept. 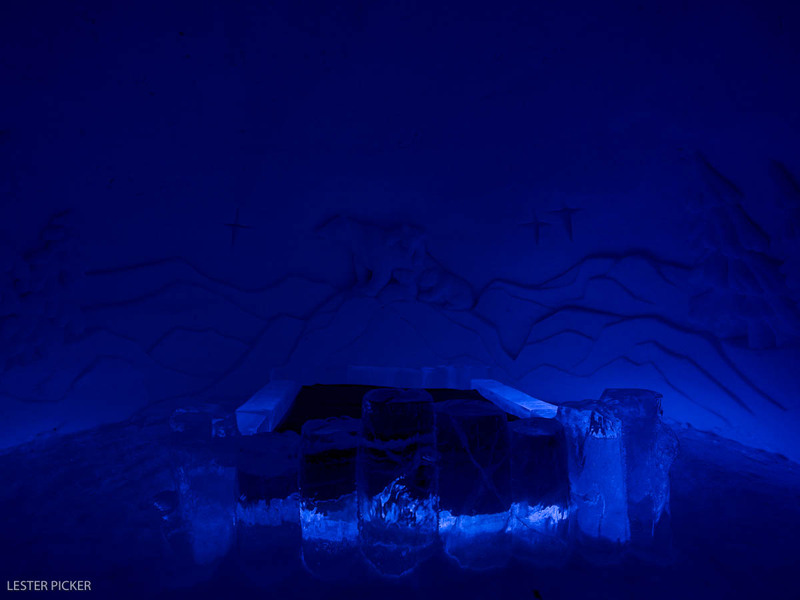 You get to sleep in an unheated building carved from pure ice and resurrected every year anew, so that in no way is the hotel the same every year. You sleep on a bed made of ice. Simple, eh? Think sleeping in your freezer. And I’ll bet you thought travel journalism is all fun and games. Last night I slept in The Snow Village Hotel located in Lainio, Finland (www.snowvillage.fi). It’s nuttier than all get-out, but it’s something I’ve wanted to do for at least 20 years, ever since I first heard of it. You all know that I’m partial to cold weather environments. Since I was going to Finland anyway to do some photography, I figured I’d finally get my chance. And so I booked into the hotel, sometimes known as the ice palace. The scoop is that every November, here in Finalnd’s north which is known as Lapland, a group of local workers cut blocks of crystal clear ice from the local river situated about 150 meters from the Snow Village. With these blocks, each of which weighs anywhere from 200 to 500 pounds, they lay a foundation and begin to build using some ingenious techniques. For example, they build a large, domed “chapel” with a ceiling that is at least 25 feet high. They do this by blowing up a huge balloon, then spraying a chemical-free, secret mixture of snow and water over the balloon. It’s so cold in Lapland in November, the structure freezes solid in three hours. They deflate the balloon and continue adding ice until the walls are 18-32 inches thick. Using prefabbed molds they then build the arched walkways of the hotel, from which radiate the 25 individual guest rooms. When the walls are thickened and hardened, they bring in the folks who work long days and nights to carve the various ice statues and wall carvings that are unique to each room. Amazingly, they do all this within four weeks. This past year it was slightly above zero well into November. Delayed to the last minute, the owners brought in carvers from China to finish the hotel in record time- 2-1⁄2 weeks! Guests are given an orientation to the Village, which is an active tourist’s paradise. The Hotel runs snowmobile tours, dogsledding tours, reindeer tours, snowshoeing and cross-country skiing tours. It does have heated cabins on the property, but I wouldn’t be writing this if that’s all they had. 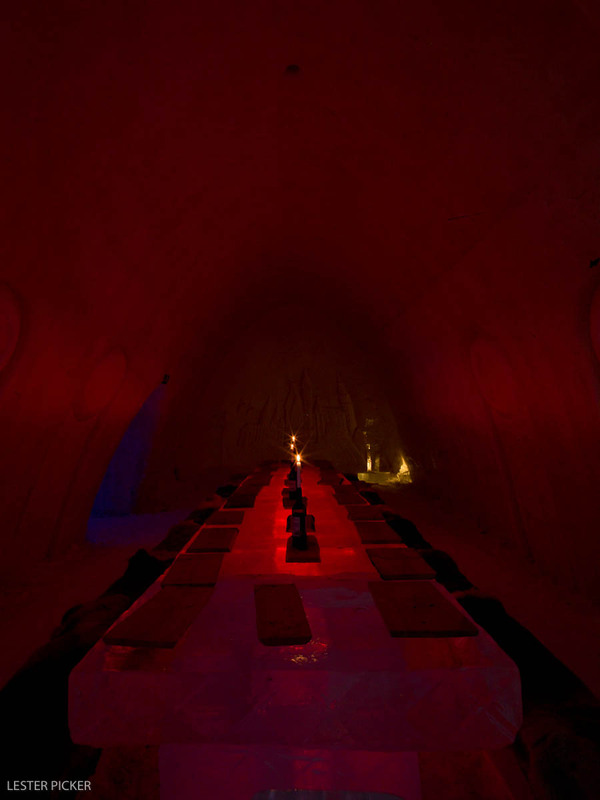 The hotel offers an ice bar and restaurant. Seriously folks, you can order drinks or an entire meal, served to you by waitresses wearing down jackets, woolen caps and mittens. At least I think they were waitresses. Could’ve been waiters, now that I think of it. First a bit of prep. You are given a well made mummy sleeping bag guaranteed to -30F. You also have a freshly washed liner and a pillow. Then follows the advice. Wear your long johns, maybe two pairs if you get cold easily while you sleep. Wear a stocking cap, even though the sleeping bag has a tight drawstring for the head area and all that is exposed are your eyes. Oh, and bring your gloves, just in case. Wow, this is getting better and better by the minute. Oh, obviously you can’t have a heated bathroom or dressing area in an ice hotel. Can you? No, you cannot, so the heated changing area is down the arched corridor and then you open two heavy wooden doors and then you run outside about 100 yards to the dressing, bathroom and shower building. Hmmm, interesting. Oh, and it might not be a good idea to drink before going to bed - actually anytime near bedtime, because, well, you know. It was forecast to be minus 30C (-22F) that night. I decided not to drink after noon. Oh, and your shoes. I forgot about those. Obviously you’ll leave them next to your “bed,” so on the odd chance that you do get up during the night to pee, you’ll find them jus a wee bit cold. So, how was it, you ask? Before the penultimate answer, I’ll quickly describe the process of going to sleep… in an ice hotel, that is. I went to the warm dressing building fully clothed, with my polar down jacket on, hat and gloves, as it was -24C (-11F) and falling rapidly. I washed up and changed into two pairs of long johns, socks and my wool cap. I donned a pair of slippers, grabbed my sleeping bag and dashed across the 100 longest meters/yards of my life to the ice hotel guest rooms, where it was a balmy -5C (+23F). In a scene from an old-time movie, in double time I spread my sleeping bag, crawled into the liner, zipped up and pulled the head covering cord tightly, so that only my eyes and nose showed. I closed my eyes and realized… I was too hot! I mean way too hot. I waited about 30 minutes and shed my extra long johns, closed my eyes, and… woke up in the morning feeling terrific! I remember a few times during the night breathing the delightfully crisp, cold air. The insulated mattress under me was comfortable, too. Finlanders know a thing or two about breakfasts. Healthy, hearty breakfasts. They know how cold demands calories. Breakfasts are a lavish affair. Breakfast smorgasbords are the rule, filled with yogurt, berries, citrus, oatmeal and other porridges, dark breads (as well as light), and the usual assortment of eggs and breakfast meats. The Snow Hotel is fortunate to have Ella Kurtakko in the kitchen. Each summer she gathers 150 quarts of blueberries and another blue berry native to Scandinavia and makes the most incredible dark blue juice you can imagine. That’s served hot and the feel of it in your mouth is indescribable. 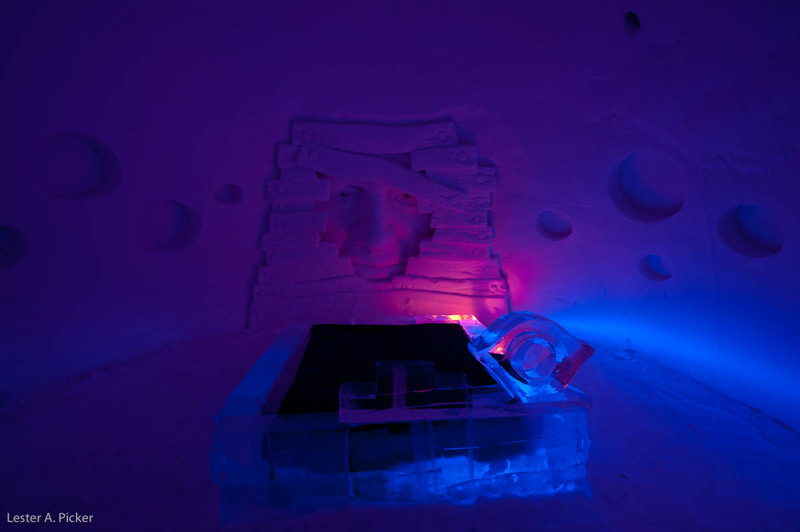 The Snow Hotel is not luxurious by any means, but it is up to European expectations. For example, it has but one tiny bathroom serving the entire reception, restaurant and bar area. The entranceway to the hotel is so unadorned, it looks like a Soviet-era clinic. There is no Internet service but, really, why would you want it in such exquisite surroundings? So, if you’re in Finland, you might want to try The Snow Village. Once. As for me, I do plan to return with some friends. As soon as I post this story, I’ll call my therapist stepson to see if he’ll give me a family discount.